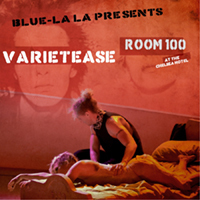 Set in New York City 1979 during the height of the punk rock era, VarieTease combines multiple genres of dance, live music, drag and theatre to tell the beautifully disturbing tale of Sid Vicious and Nancy Spungen's last night together. From the producer of last year's hit Josephine and featuring Blue Star, Jack Kreeger, Jose Navarro and Tymisha Harris. A feast for the senses, well, just two senses: the eyes and the ears. The excellent choreography and thrilling dance moves provides a treat for the eyes. The talented dancing drives the energy that penetrates the performance throughout. The stunning costumes lure your eyes and the hypnotic movement keeps you entranced. At times shocking, at times reflective and often seductive, the movements propel your emotions. The music completes the ambiance, taking you from sympathetic to shock, with stops at serene and sedated. You know you’ll be in for a musical journey when the early tracks include Fleetwood Mac’s “Tusk” and a frightening rendition of Phil Collins already hateful “In the Air Tonight.” Most of the tunes keep your toes tapping while the violin leads take you into pensive retreat. This spirited journey takes you on a high and the inevitable crash. Running time clocks out at 45 minutes, a bit short of the advertised hour slot.